"Shine" was short for "Sunshine" named by his Mother because of his blonde hair, beautiful blue eyes and bright smile.... He was just 'Shine"! 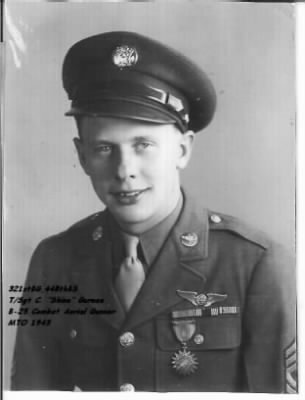 T/Sgt, Gunner B25 "Little Joe", 448th Bomb Squadron, 321st Bomb Group, 12th Air Force, U.S.A.A.F. Curator's Note: Sgt. Gurnee passed away in 2007, this story is submitted by next of kin who may be contacted at the email below. Looking for more information about Clarence E Gurnee?